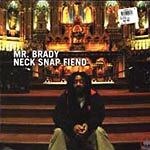 Brady is one of the tightest, most underrated MC's around. This guy deserves a lot of credit. He has a mean, raw, gritty sound to him that is just unparalled to. Why else do you think BattleAxe would be putting him on their label? Produced by Mr. Brady and Rob the Viking. Vocals by Mr. Brady.